This rare photograph shows a Chief Boatman in Charge in his full dress uniform, with sword. William Davie, shown in 1863, came from a whole family of coastguards. His brother served in a revenue cruiser based at Whitstable, and was also stationed at Tankerton. 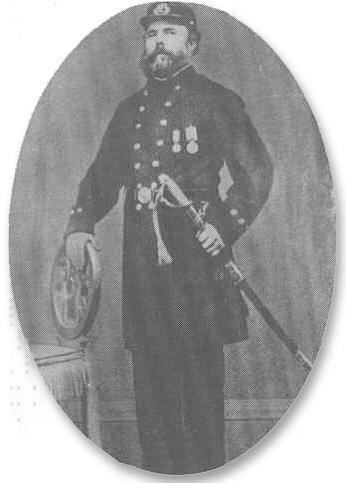 'Captain ' Campbell would have worn a similar uniform. Nice to see a photograph of my Great Great Geandfather. Portreath St Agnes Cornwall on the 2 Dec 1863. William Davie was also a forbear of mine through my grandmother Gwendoline Davie. He served at a number of locations including Rye where he was located at various of the Towers at different times. It seems these were Martello Towers, where their families also lived since these were given as the address for the census. Does anyone know anything about these Towers, except that all but one have been demolished. Where does this photo originate from? It is the only picture I have ever seen of William Davie. Thank you. Tricia - his great, great,great granddaughter. The Martello Tower where William Davie lived in Rye was destroyed in the 1890's. I think the photo of William Davie was taken near Gwithian in Cornwall where he was stationed in the 1850's & 1860's. Dear Brian Davie - if he was your great great grandfather we must be related as he was my great great great grandfather. ! How amazing! All the best, Tricia. Dear Tricia, - We are related. Your grandmother Gwendoline Davie father was William Henry Davie born Barnstaple 1875 -1940. He was the eldest brother of my grandfather Arthur Smyth Davie born Barnstaple 1883- 1960. My father was also called William Henry Davie named after your great grandfather.